Whether it’s the grief of bereavement, the strain of divorce or the uncertainty of a new home or school, loss and change affect children in countless ways. Nevertheless, teachers and parents frequently find themselves ill equipped to help children struggling with the difficult feelings that these situations, and others like them, bring. Helping Children Cope with Loss and Change offers guided support for teachers, health professionals and parents. 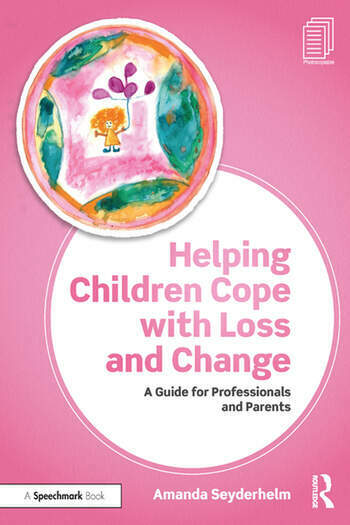 With chapters that move from Loss and Change to Resolution and Resilience, addressing the needs of both the child and caregiver, Helping Children Cope with Loss and Change will be an invaluable therapeutic tool. Amanda Seyderhelm is an experienced Play Therapist and enables affected children to make sense of their feelings and to find a comfortable way to express themselves and their worries through their natural language of play. She can be found in her Stamford practice where she offers one to one sessions, and at Great Ormond Street Hospital where is an Ambassador. She is also the resident play therapist at the Faculty of The Child and Family Practice, a centre of excellence for child and family mental health. Amanda has a a BA degree and a Postgraduate Diploma in Play Therapy and is a member of Play Therapy UK and BACP.